A graphically based user interface to create, display, manipulate and process geometry. Access to most of the functionality/functions found in the Python/IRIT interpreter (Irit.exe) and is built around the IRIT geometric kernel package. Any other IRIT (or new/arbitrary) function could be easily exposed as well, using DLL extensions abilities of GUIRIT (See below). Fully configurables menus (Via the guirit.cfg configuration file). Fully configurables keyboard/mouse/gesture event bindings (Via guirit.cfg). Programmable extension interface. Many of the existing functions in GUIRIT (and in the Python/IRIT interpreter) are built using this extension interfaces that allows one to create external extension as DLLs (or shared libraries on non-windows platforms) without resorting to rebuilding the GuIrit executable. Using wxWidgets, and hence it is supposed to be relatively simple to port to other environments. So far,GUIRITwas tested on Windows and Linux Fedora, and to a lesser extent on MAC OSX. Below, we provide (auto-installer) executables for Windows and Mac as well as the full C/C++ sources. If you use Windows and unless you have MS Visual Studio 2008 (9.0 .net) SP1 installed on your system you will also be required to install (once only) the run time env. of this compiler from Microsoft. Download the compiled-for-windows GuIrit zip file and open it in a directory of your selection. Go into the directory in 2, and run GuIritInstallGuiCfg.cmd (once only). This creates a directory "%USERPROFILE%\Application Data\GuIrit" and place there a default GUI configuration file. Run GuIrit.exe. If everything worked out fine, you should see something like in the "1st Run" section below. The installation also includes some minimal documentation and a few models as examples, in the Docs and Models subdirectories, respectively. If you use Windows, you can also download GuIritInstall.exe (or 64 bit GuIritInstall64.exe version) and execute it for a fully automated installation. A comment in Windows. In Windows the %USERPROFILE% expansion is different than XP and hence you will have to text-edit the cfg files and GuIritInstallGuiCfg.cmd to the proper directory. If you use a Mac, you can also download GuIritInstallMac.pkg and execute it for a fully automated installation. Your installed GuIrit should be under the "launch pad" as a new application (look for the Ant icon). Note this installer needs X11 (typically under /opt/x11) and will automatically install it if none is found. Make sure to examine the messages in the “General Output” windows that appear in the bottom left window. Red color messages will hint on problems. Green means everything loaded/initialized fine. 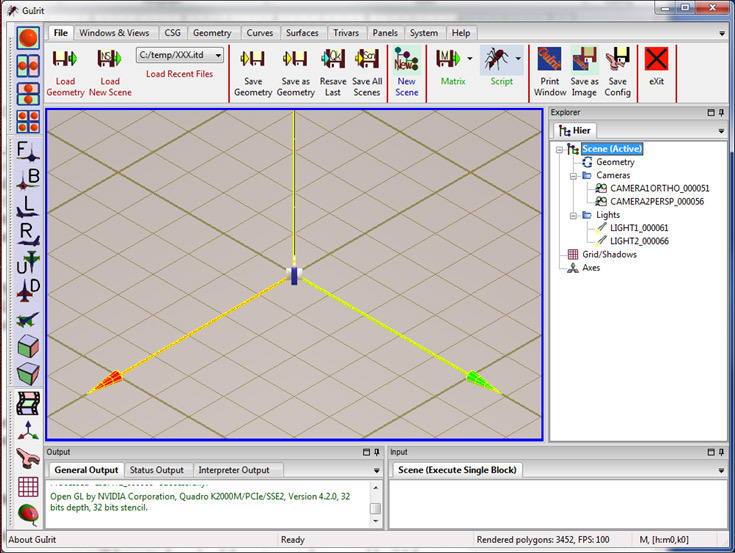 GUIRIT is a graphical user interface for the IRIT modeling package and is built using wxWidgets. This means you will have to download these two packages and build them before you can built GuIrit. These tasks are NOT trivial and unless you consider yourself knowledgeable, please do not attempt this. I cannot provide support and/or answer compilation questions. Yet, some 'readme' information could be found in the Docs subdirectory of the Guirit Distribution. Finally, for the latest (alpha version) GuIrit sources, please see here. Enjoy and comments are always welcome! Copyright © Gershon Elber, 2008-2016. All rights reserved.